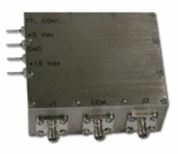 This solid state RF switch has a 1P2T configuration and operates in the 960-1300 MHz frequency range. It has an impedance of 50 Ohms nominal, a -20oC to +70oC operating temperature range, and more. The 50S-1832 is a 1P2T reflective solid state RF switch. It has a VSWR of 1.2:1 (typical)/1.3:1 (maximum), 0.50 dB (typical) insertion loss/0.75 dB (maximum), 46 dB (typical)/40 dB (minimum) isolation, 10 m/s (maximum) switching speed, and much more. Like all of JFW’s 50 Ohm high power solid-state RF switches, this model is ideal for high power coaxial switch applications. Download the datasheet for more information.